One would think at my age (which I refuse to reveal) I would not be surprised or shocked any more at what people do and say. Yet, I find myself speechless at what people will say and how they will act. And the people who surprise me the most? Christians. Or at least they claim to be Christians. Rather than judging and criticizing and condemning others, shouldn’t we offer mercy and grace instead? God is a God of mercy. We read this in scripture over and over again. If God is a God of mercy, then we, who want to grow more like Jesus, should be people of mercy. And as the people of mercy gather as one within the four walls of what we call “church,” it is, or should be, a place of mercy. Those are strong words Jesus spoke to his disciples. So how can we, as merciful people, turn anyone away from the four walls of what we call the church? What if a homeless person, dirty, smelly, and hungry came to the church on Sunday morning just as service was about to begin? Would he or she be turned away? Or an alcoholic, who went on a binge the night before, staggers into the sanctuary after service has started? Would the ushers help him leave? Or a prostitute, still in her “working” clothes? Would she be shunned and turned away? 5% of all author profits from KEEP IT SHUT will be donated to Samaritans Purse for their cleft lip repair ministry. In South Sudan, children who are born with a cleft lip are often shunned by society because of the false belief that they are possessed by evil. 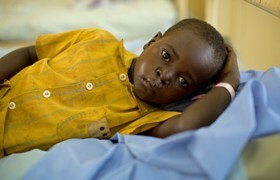 The money donated will help volunteer medical teams to perform cleft lip and palate surgeries for patients of all ages. As we learn to use our lips for good and not evil, we can help these sweet children be rid of this horrible stigma in their society.